Home >> Articles >> What are the Possible Types of Back Pain? What are the Possible Types of Back Pain? Back pain can be caused by an overstretching or other trauma to the back muscles and/or tendons. A tearing or inflammation of the ligaments in the spine can also cause back Pain. However, the most common and serious cause of back pain is spasm of the muscles in the lower back area brought on by spinal disease, injury or degeneration. Back pain can be caused by an overstretching or other trauma to the back muscles and/or tendons. A tearing or inflammation of the ligaments in the spine can also cause back Pain. However, the most common and serious cause of back pain is spasm of the muscles in the lower back area brought on by spinal disease, injury or degeneration. Naturally, all of these problems can arise from many different circumstances. Because lower back pain is the most common type of back pain, most of the research materials I have collected focus on this area. In order to have a clear understanding about lower back pain, we can envision that the spinal elements structured as a "three-joint complex," with a disc and two facet joints at each level. If there is any change in one element, the other two will also be affected. When a person assumes a normal relaxed, standing position, the vertebral bodies will be loosely piled up on the top of each other. Whenever there is a disease, which affects any one of the three elements, the intrinsic muscles will contract and develop protective splinting to prevent any micro instability that may occur. Which can then result in ischemic from prolonged contraction and begin to ache, lose tone, and eventually atrophy. The prime symptom of spine problems is pain. Pain is the most common signal that the body uses to notify your brain about the problem of Qi imbalance or possible physical damage/injury to your body. Pain generated from structures other than the spinal cord or nerve roots can be classified as either local, referred, and muscular. If you are able to identify the type of pain you have, you may be able to better pinpoint the problem. Local pain usually results from the irritation of nerve endings at the site of the pathologic process. Local pain is usually steady and aching; it may occur off and on, particularly when the involved structure is moved. Local pain is commonly associated with tenderness to palpation or percussion. The site of local pain can be diagnosed relatively easier than other causes of back pain. For example, metastatic tumors and osteoporotic collapse of a vertebral body can cause pain at the site of the lesion by irritating the nerve endings in the periosteum surrounding the vertebrae body. However, those metastatic tumors involving the vertebral body that do not upset the periosteum are usually painless. Other than the neck and lower back, tumors also often strike the thoracic area, and osteoporotic vertebral collapse also tends to affect the structurally weak thoracic vertebral bodies. Intervertebral discs may also cause local pain when they compress nerve endings in the anulus fibrosus or posterior longitudinal ligament. Most spine pain from mechanical causes, such as a herniated disc, occur either in the neck or lower back because these structures are more mobile and more subject to injury. The character of local pain is frequently helpful in diagnosis. Pain caused by lumbar muscle, ligamentous strain or herniated discs usually disappears when the patient lies down and the torso is relaxed. Herniated lumbar disc pain is often made worse by sitting and is relieved when standing or walking. However, on the contrary, the pain of spinal stenosis is often absent when lying or sitting, and occurs only when the patient walks. Vertebral metastases with or without epidural spinal cord compression cause pain. The pain is often more serious when lying and sometimes is relieved by sitting up. To ease the pain, many patients with spinal cord compression elect to sleep in a sitting position. Often, even if pain is absent when lying down, any movement such as turning over or arising may be particularly painful. Referred Pain. Referred pain is felt at a distance from the site of the local lesion, but not in the dermatomal distribution of a nerve root (radicular pain). Referred pain, like local pain, has a deep aching quality and is often associated with tenderness of subcutaneous tissues and muscles at the site of referral. Treating maneuvers that affect local pain usually have the same effect on referred pain. Referred Pain produces a sclerotomal distribution of pain. Pain referred from pathologic abnormalities of the cervical spine often is either just medial to the scapula or over the lateral aspect of the arm. Pain referred from the lower back is usually appreciated in the buttocks and posterior thighs, although rarely below the knees. Pain from the upper lumbar spine is also often referred to the flank, groin, and anterior thigh. Pain also can be referred to the spine from lesions of thoracic or abdominal viscera, a prominent example being back pain from pancreatic carcinoma. Referred back pain from a visceral source is usually not worsened by positional changes, as is mechanical lower back pain. Radicular Pain. Injured spinal roots or an injured spinal cord can also produce, respectively, radicular or funicular pain. Radicular pain is the prime symptom of nerve root compression. Nerve roots are not usually pain-sensitive. However, chronic compression can lead to edema, and perhaps inflammation and demyelination. In this case, the root will become sensitive to stretching or compression. When compressed, the pain may be experienced only in the cutaneous distribution (dermatome) of the involved root or may be felt locally and deep in muscles that it supplies. Root pain is usually least severe in proper positions, in which the root compression is minimized. Naturally, the pain will become serious in positions that cause the root to be compressed or stretched. Root pain is usually worsened by increased intraspinal pressure due to coughing, sneezing, and straining. Although similar, the pain distribution of radicular pain is not identical to referred pain. A common misconception is that referred pain radiates only as far down as the knee, and radicular pain radiates only below the knee. In fact, the only distinguishing feature between the two types of pain is in their quality. Referred pain is an aching or sore type of pain, while radicular pain is a sharp, lancinating, or burning type of pain. Direct mechanical compression of the nerve (neuritis). Compression of the vasa nervorum, which produces a local anemia caused by mechanical obstruction of the blood supply (ischemia). Chemical irritation of the dural sleeve (i.e. the dura mater that covers the spinal cord), which causes inflammation (duritis). Dura mater is a tough, fibrous, whitish membrane (the outermost of the three membranes) that covers the brain and spinal cord. Funicular Pain. Funicular pain is caused by compression of the long tracts of the spinal cord. Normally, funicular pain is less sharp than radicular pain and is often described as a cold, unpleasant sensation in the extremity. Its distribution is more diffuse than that of radicular pain, but like root pain is usually worsened by movements that stretch the cord (e.g. neck flexion or straight leg raising) or that increase intraspinal pressure. Muscle pain occurs when paravertebral muscle spasm occurs due to an injury to or structural abnormality of the spine. Sustained contraction of paravertebral muscles causes chronic aching pain, which is usually felt lateral to the midline of the neck or back. Palpation of painful muscles is a common diagnosis method to reveal evidence of spasm and tenderness. Often when areas of extreme sensitivity (trigger points) are palpated, the pain may be felt not only locally in the muscle but also may be referred to distant structures. 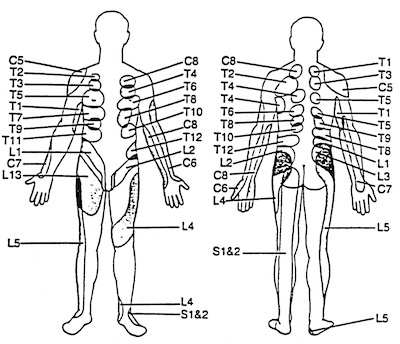 These trigger points are considered as the causes underlying many myofascial pain syndromes of the neck and back without structural abnormalities of the spine.